Having been a PADI Instructor for 13 years and a Course Director for the last 8, I still remember teaching my first courses and can almost still feel the nervous energy, anticipation and astonishing sense of responsibility that my new trainees are sure to face in the coming months. As much as my colleagues and I put into our Instructor programs, we realize that the real education of a new Instructor has only just begun. For many, the challenge of creating their own path in this industry will result in a long-term career filled with an array of experiences that may be unmatched in the professional world. For some, becoming a PADI Instructor is a personal success that will always define them as people who embrace challenges. Others still, may find this new role as a temporary diversion from life’s greater adventures. But for all, the time that they have spent in achieving the rating and the work they do in the industry will enrich their lives and teach them skills that will forever be utilized. 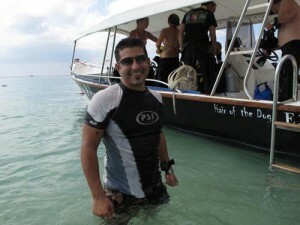 At times, my journey as a PADI Instructor has been defined by each of these motivations. Eventually, I came to the realization that there are few jobs which can bring a combination of the satisfaction, adventure and lifestyle that I enjoy in the dive industry. Posted in: scuba diving internships. ← Thailand Gap Internships Looks Forward to 2012!